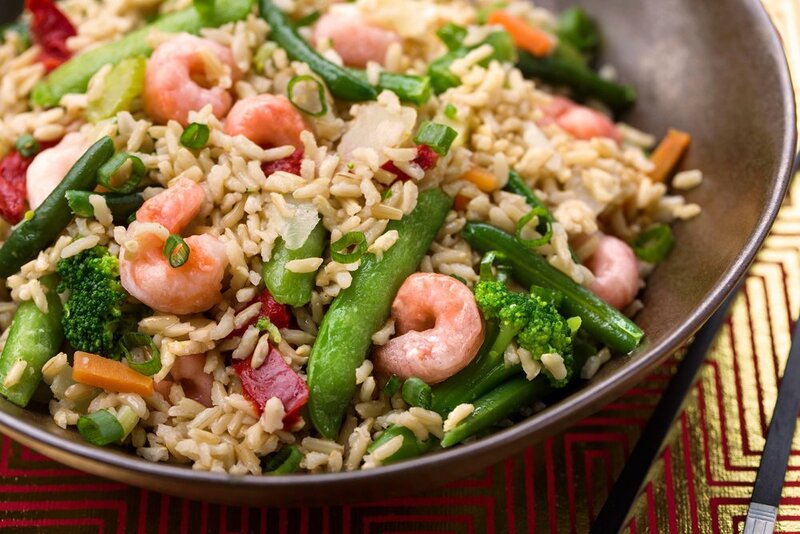 Recipe: Shrimp Fried Rice — New Wave Foods, Seafood from Seaplants! Set a large skillet over medium heat and add 1 tablespoon of the peanut oil. Once the oil is shimmering, toss in the shrimp, sautéing for about 5 minutes until very lightly golden all over. Transfer to a plate and set aside. 3 – 4 minutes, stirring frequently, until highly aromatic . Increase the heat to high and introduce the cooked rice. Drizzle the soy sauce evenly over the mixture and continue to sauté, browning the grains and incorporating all the seasonings. After about 5 minutes of constant stirring, fold in the vegetables, shrimp, and scallions. Cook until piping hot all the way through, adjust seasoning to taste with remaining red pepper flakes if desired, and serve right away.